Good news. Better to keep it short and not overexploit it, so it lasts longer. Guests for tonight’s season two finale include Poh Ling Yeow, Peter Helliar, Luke McGregor and Susie Youssef. She was on the show last night. TEN Renews Hughesy, We Have A Problem And Show Me The Movie!. Network Ten today announced it has commissioned new seasons of the hit comedy series Hughesy, We Have A Problem and Show Me The Movie!. Both series have generated strong results for Network Ten since they debuted earlier this year. 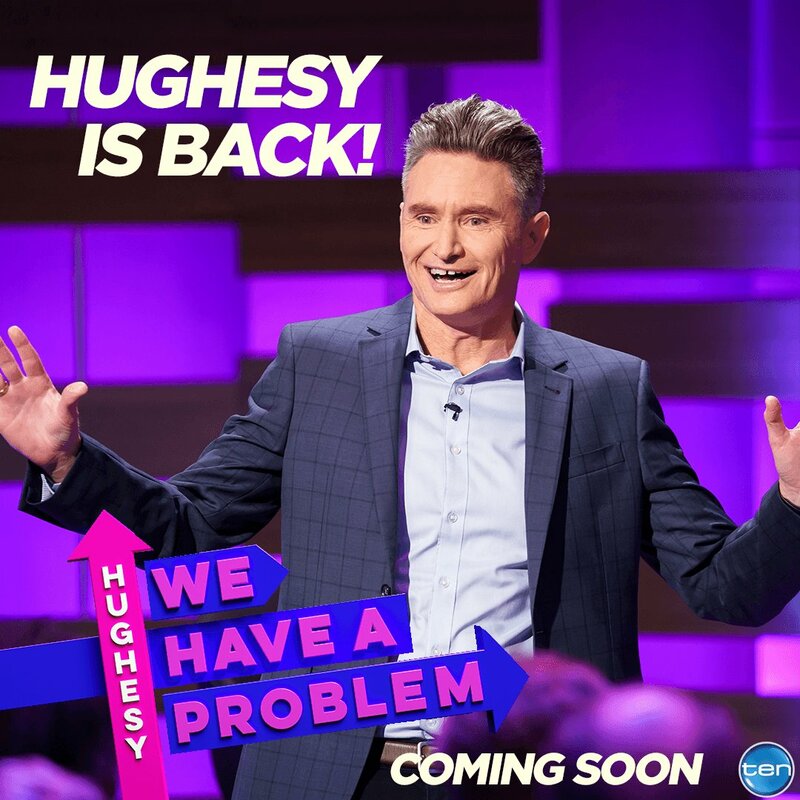 Hosted by Dave “Hughesy” Hughes and produced for Network Ten by Screentime, Hughesy, We Have A Problem has been embraced by viewers since it went to air in late January and has increased TEN’s audience in its timeslot by 45% in people 25 to 54 and 41% in under 55s. Each week, Hughesy and a stellar line-up of entertainers such as Peter Helliar Julia Morris, Kate Langbroek, Dave Thornton, Ross Noble, Fiona O’Loughlin, Merrick Watts, Luke McGregor and Judith Lucy have solved the problems of everyday Australians – and invariably Hughesy’s many personal problems. Each week, Rove, his team captains and a cast of different actors, comedians and visiting international stars did battle in a series of funny, irreverent and always entertaining rounds about the good, the bad and the ugly of the big screen. Network Ten Chief Content Officer, Beverley McGarvey, said: “Last year we made a commitment to significantly increase the amount of original comedy on TEN. “The comedy doesn’t stop there. We will keep Australia laughing this year with more shows including the brand new season of Have You Been Paying Attention?, Russell Coight’s All Aussie Adventures, more Gogglebox, Street Smart, How To Stay Married and other new programs we will announce soon,” she said. Not surprised, Ten seems to renew everything that rates low and is cheap to produce. Anything that avoids spending any actual money to fix their under performing schedule. Including the other networks that must be laughing their asses off at being handed easy ratings victories and eyeballs. Look forward to the ABC beating you Ten because fourth place is firmly where you’ll be. Yeah but the ABC receives no money from advertising . Hughesy is getting ready to solve your problems! Hughesy, We Have A Problem Coming Soon to TEN. For a third series? We haven’t even had the second series yet. we have already. When they decided to air more episodes than they originally slated for. The network counted those extra episodes as a second season. Really? But it was announced earlier this year that it would be back for another series last this year? But it was announced earlier this year that it would be back for another series last this year? They said it would it be back but they didn’t say when. The eps shown earlier this year were filmed in two runs and were described as Season1 and Season2. That is a pity. Thought we were getting another season before the end of the year. I think it’s good that it’s taken a break. People were saying it was starting to get a big same same towards the end so having a break and coming back with hopefully some new ideas and angles will do it good. That is probably true. I think it was more that it was in my head it was starting soon and having something else to watch rather than the timing. If I hadn’t thought it was starting in a few weeks it would be fine. Its a bit confusing the first lot of episodes are season 1 and 2. They should have just marked them as the first season. Maybe because they were screened back to back but season 1 was filmed in 2017. When it was a success, Ten commissioned season 2 which was filmed in 2018 and rushed it to air. Yeah i realise that would just make more season for them to call them the same season, or first half of the season and second half of the season. Am I think only one that thinks that? It has a lot to do with funding and budgets too.